Australian actress Naomi Watts has partnered with US actress and film producer Reese Witherspoon and US film producer Bruna Papandrea to option the rights to Penguin Bloom (Cameron Bloom & Bradley Trevor Greive, ABC Books), the true story of a Sydney family and their relationship with a magpie chick. Watts is set to star in the film and will co-produce with Witherspoon, Papandrea and Australian producer Emma Cooper. A director and screenwriter is yet to be announced. Watts said she was captivated by the story of the Bloom family and the magpie chick dubbed Penguin that helped the family adjust after a near-fatal accident left Sam Bloom paralyzed. ‘Sam’s undeniable spirit and the intense physical and emotional journey she and her family embraced resonated with me both as a storyteller and as a mother,’ said Watts. 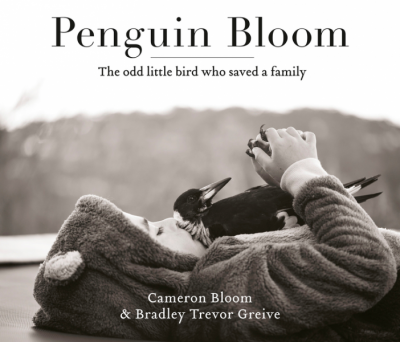 The book includes Cameron Bloom’s photographs of his family with Penguin, which were originally posted to social media, where they attracted thousands of followers. Australian author Bradley Trevor Greive wrote the text. In a joint statement, Cameron and Sam Bloom said they hoped the movie ‘will continue to generate awareness and support for the vital spinal cord injury research via SpinalCure Australia, Wings for Life, The Christopher and Dana Reeve Foundation and other leading charities we are partnering with all around the world’. ‘Penguin has changed our lives for the better in so many wonderful ways,’ they said.